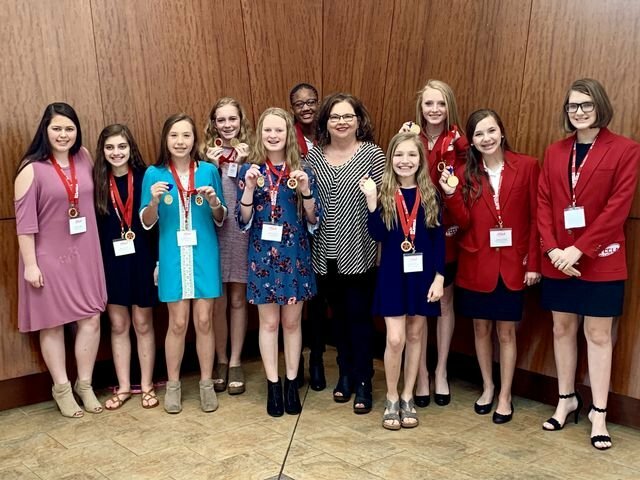 Saraland Middle School FCCLA received all gold medals at the Alabama FCCLA State Leadership Conference. The following groups received BEST overall: Focus on Children (Shelby Brown, Rilee Pacheco, Kourtlyn Smyly), National Programs in Action (Brooklynn Stephenson), and Life Event Planning (Natalie Criswell, Kaylee Abston, and Makayla Reed). Madison Jernigan received third place gold in Recycle and Design. A special thanks to Mrs. Patterson for her hard work in preparing our students for this state conference.